It wasn’t until I started traveling to Europe and Asia on my own that I figured out the unique versatility of the pashmina (or sarong or scarf). I learned this via quiet observation of French women. Not only on the street or in cafes, but in the airport as well. One item of clothing that was consistently present no matter what their outfit, was a scarf. At first, I thought it was just part of the style, but then I came to understand there was a purpose as well. There are so many uses for this beautiful piece of cloth that it makes it an essential travel tool. It can be worn to warm you up. It can be used as a blanket. Or as a cushion for an uncomfortable seat. Depending on the material you can use it as a towel. It can become a shirt or a skirt. And definitely an eyeglass or camera lens cleaner! Also, if you tend to pack light like I do, meaning monochrome colors that can be worn in layers, a pashmina is a way to add color or to dress up an outfit for an evening out. I have them in a ton of colors, styles, and weights and wear one nearly every day. There is my favorite, a light gray cashmere one that I bring with me on every trip I make. I got it during one of the bi-annual sales when I was working in Switzerland. 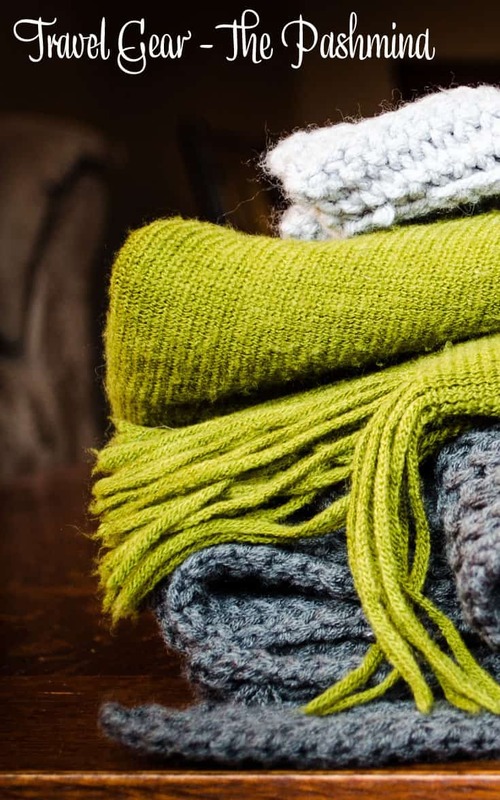 I paid a rock-bottom price for 100% cashmere and would be heartbroken if I ever lost it! How about you? Do you travel with a pashmina (or sarong or scarf)? Do you have a favorite one? Or a unique use? Yes! I have two pashminas (in different colors) and I always take them with me when I travel. They’re so convenient!! @San, hey nice to see you again, I lost track of you and your blog, but you are back in my feeder now! 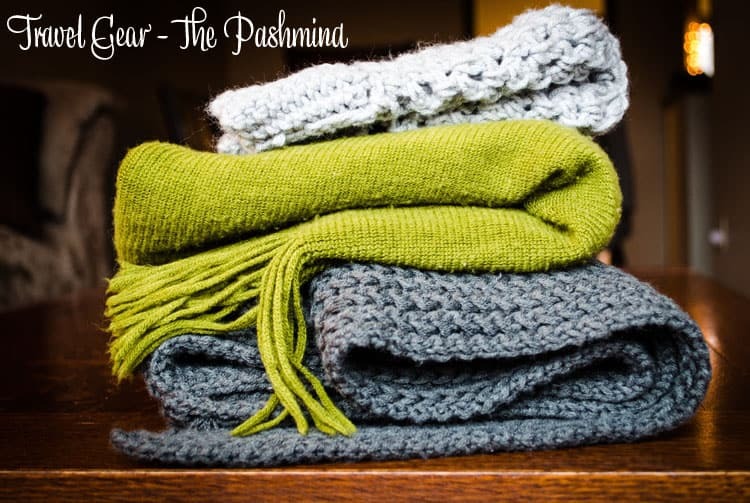 Regarding the pashmina…I know, I can’t believe I lived half my life without one! I’ve started using scarves more often and have a number of them.. but not enough of the Pashmina’s. I get frequent hot flashes now, so if I dress more lightly the scarf allows me to ‘lighten’ up immediately. Now that you’ve mentioned the grey one, I want that color. I have a lovely periwinkle pashmina, and a hot pink cotton scarf and a black one. @Walker, a pashmina/scarf is perfect for quick temperature changes, I am constantly pulling my on and off! I always travel with my Pashmina scarf. And I always put a small spritz of my favorite perfume on it before I leave as well. It’s lightweight to carry and I can stuff in it in purse if I need to. I can use it as a blanket if I’m cold, as a deterrent to not have to talk to my plane neighbor, or as I have in many cases when traveling to Europe, as a way to avoid that stinky European who hadn’t showered in a couple of days. And it’s a great accessory for my trip…especially if I’m traveling somewhere colder than here so I really do need a scarf! @AndiP, my second favorite is one from Tibet also. An old boss gave it to me as a gift. thanks so much for the links, Andi! i will check them out. i am in SF too so local is good. btw, i’m a francophile too but have not been able to travel for quite a few years so really enjoy hearing about your adventures! @Ruth, I hope they help. You can find them on the weekends at the artist market in front of the Ferry Building. I didn’t realize you were in SF, I am going to email you about another post I am working on! @Amy75, I am so glad that you thought of me! I like your post. yes, I have three pashmina in different colors and i take them when i am going to outside its really good in every time.